Variables have different scope, according to where and how you define them. In the top subroutine called SomethingElse, any attempt to reference HeroName will fail, since it is defined within the separate procedure RecordVote and hence is local to that. Most variables that you create will be locally defined within a single subroutine like this. 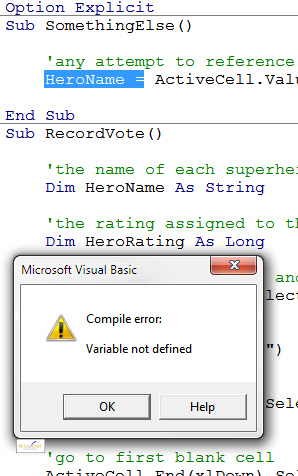 In the code above, HeroName and HeroRating are defined across all procedures within this module. Dim and Private mean the same thing in the above context. Note that the word Global is old-fashioned, but is still supported - you should use Public instead by preference. If you're using public variables, you may instead want to create them as constants instead - the subject of the last part of this blog.